The Volcker Alliance evaluated all fifty states in each of five budgeting categories: Budget Forecasting, Budget Maneuvers, Legacy Costs, Reserve Funds, and Transparency. Select a Fiscal Year (or 3-Year Average) on the data visualization below to explore the budget category grade distributions among the states. 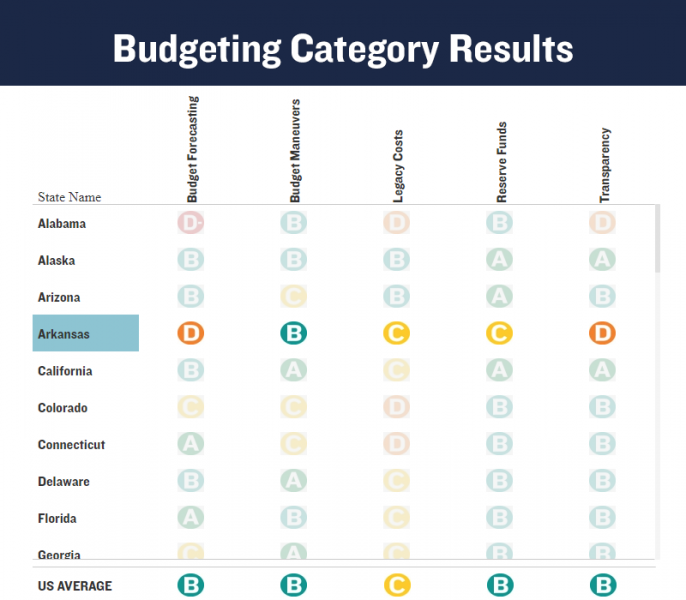 The color-coded dots reflect the grades received for each budgeting category, with the size of each dot representative of the number of states that received a particular grade. On the chart below (box and whisker plot), the horizontal lines at the ends of each vertical line represent the highest and lowest grade received in that category, the upper and lower ends of the boxes represent the upper and lower quartiles of the grade distribution, and the center between the differently shaded boxes represents the median grade received in each category, for the selected fiscal year.. Hover over a colored dot to view a count and list of the states receiving that grade, in that particular category, for the selected fiscal year (or 3-Year Average). Hover over the gray boxes to view a breakdown of the grade distribution, with the numerical grade equivalents shown (A = 5, B = 4, C = 3, D = 2, D- = 1). You can download the data set as a spreadsheet file, including all the budgeting category grades for all 50 states as well as the US average grades for fiscal years 2016-2018 plus 3-year averages, by using the 'Download Data' button at the top right of this page. In the Truth and Integrity in State Budgeting: Preventing the Next Fiscal Crisis report covering all fifty states over the fiscal years of 2016 through 2018, the Volcker Alliance focuses on five critical areas that explain methods used to achieve budgetary balance, as well as how budgets and other financial information are disclosed to the public. and comprehensiveness of disclosure of budgetary information, including tax expenditures and infrastructure replacement costs. In each category identified below, a state was given a grade ranging from A to D-minus. Although there are no “failed states,” the results, as might be expected, cover a wide spectrum, with especially excellent or weak performances scattered across the nation. Budget Forecasting evaluates whether and how states estimated long-term revenue and expenditure trends. Budget Maneuvers evaluates whether states used one-time revenues, borrowings, asset sales, and other measures to achieve short-term budgetary balance. 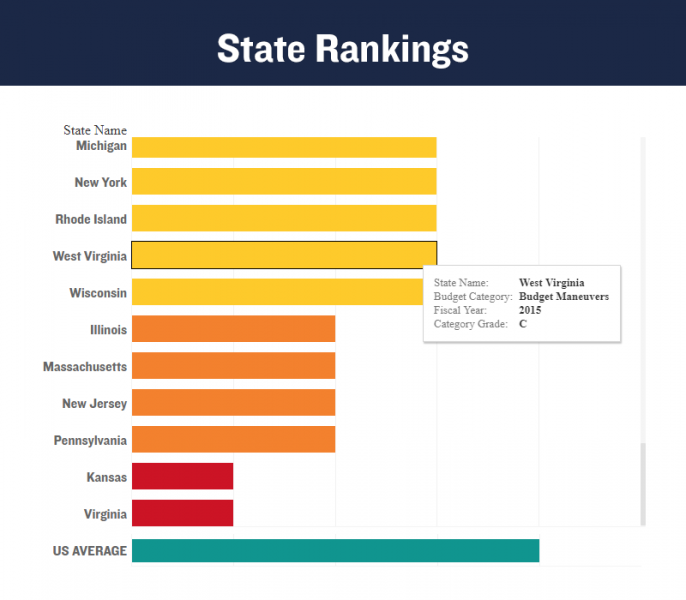 Legacy Costs evaluates whether states provided adequate funding, as defined by retirement system actuaries, for pensions and other promised retirement benefits for public workers. The Legacy Costs budgeting category grade was modified to also take into account any unfunded pension liabilities (pension funding ratios were compiled by Bloomberg as of the end of the fiscal year in question; the ratios were not available for fiscal 2018 as of our publication deadline, so fiscal 2017 data were used instead). Reserve Funds evaluates states’ rainy day funds and other fiscal reserves, as well as any policies governing their use and replenishment. 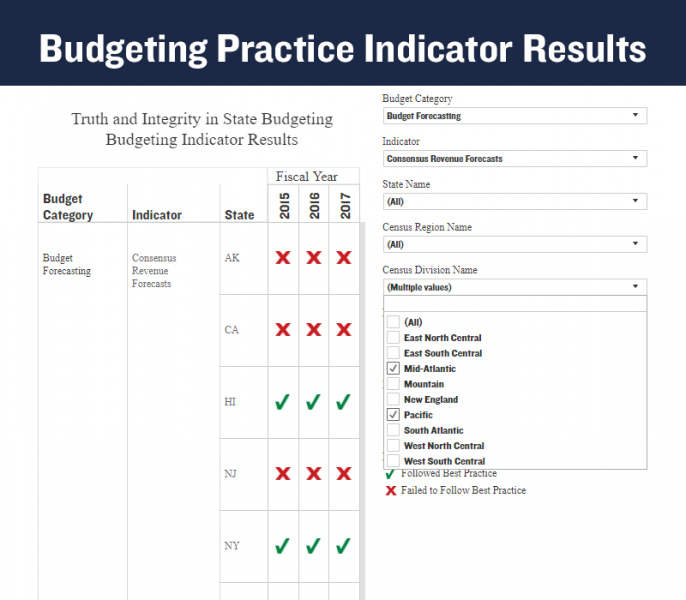 Transparency evaluates the accessibility to the public of states’ budget practices. The Budget Forecasting category grades reflect the Volcker Alliance’s assessments of the scope and quality of the fifty states’ budgetary forecasting during the fiscal years of 2016 through 2018. States are graded on a scale of A to D-minus, the lowest possible, on whether they used consensus revenue estimates for the coming year or biennium in budget documents; provided a reasonable, detailed rationale to support revenue growth projections at time of initial budget; utilized multiyear revenue forecasts for at least three full fiscal years in budget and planning documents; and utilized multiyear expenditure forecasts for at least three full fiscal years in budget and planning documents. The Budget Maneuvers category grades reflect the Volcker Alliance’s assessments of the fifty states’ use of onetime actions to cover recurring costs and balance budgets during the fiscal years of 2016 through 2018. States are graded on a scale of A to D-minus, the lowest possible, on whether they successfully avoided these one-time techniques: using proceeds of borrowing to pay for recurring expenditures; using “scoop and toss” refinancing to raise funds for any current expenditures, including debt service; diverting bond premiums (or other up-front cash flows generated during sales of bonds or other financial transactions) into the general fund or other general revenue account; using pension bond proceeds to make the annual required or actuarially determined contribution to any pension; using up-front proceeds or deferral of up-front costs on financial transactions to fund recurring expenditures; using proceeds from material, nonrecurring asset sales (excluding routine disposals of surplus or outdated property) to fund recurring expenditures; deferring recurring expenditures, excluding those for capital projects, into future fiscal years from the current year; using one-time transfers into the general fund from special funds to pay for recurring expenditures; and temporarily shifting costs to counties, municipalities, school districts, or other governments or agencies, or upstreaming cash from any such entity to the state, that is not part of a regular agreement or process. The Legacy Costs category grades reflect the Volcker Alliance’s ability to meet promises made to public employees for pensions and other retirement costs, when applicable, during the fiscal years of 2016 through 2018. States are graded on a scale of A to D-minus, the lowest possible, on whether their contributions to public employee pension funds were effectively 100 percent of the actuarially required or determined amounts, adjusted for any unfunded liabilities (pension funding ratios were compiled by Bloomberg as of the end of the fiscal year in question; the ratios were not available for fiscal 2018 as of our publication deadline, so fiscal 2017 data were used instead); and whether their contributions to any public employee OPEB plans were effectively 100 percent of the ADC or ARC. The Reserve Funds category grades reflect the Volcker Alliance’s assessments of the fifty states’ balances and policies for financial reserve funds during the fiscal years of 2016 through 2018. States are graded on a scale of A to D-minus, the lowest possible, on the following: whether they had policies (set by constitution, referendum, statute, or other formal rule) for the use and replenishment of rainy day funds; whether the rainy day fund balance (or contribution) was specifically tied to the historical trend of revenue volatility; and whether the rainy day fund or general fund balances were greater than zero on the first day of the fiscal year. The Transparency category grades reflect the Volcker Alliance’s assessments of the fifty states’ actions to promote greater transparency of their budget and related information during the fiscal years of 2016 through 2018. States are graded on a scale of A to D-minus, the lowest possible, on whether they had a consolidated website or set of related sites providing budget and supplemental data; provided tables listing outstanding debt, debt-service costs, and information on any legal debt limits; disclosed the estimated cost of the deferred infrastructure maintenance liability for all capital assets as part of budget and planning documents; and provided an annual or biennial tax expenditure report in budget documents or through other agencies. State fiscal sustainability is of no small concern to the US economy or the federal government. As Volcker Alliance Chairman Paul A. Volcker stated in 2017, “The purposes and manner in which public funds are spent are matters basic to our well-being as a nation.” Indeed, states generate $2.1 trillion in annual revenue, equivalent to 10.3 percent of the nation’s gross domestic product. State and local governments—the latter heavily dependent on state budget funding—employ almost twenty million people. Spending decisions are appropriate and necessary issues for political debate and decision. The Great Recession and the relatively slow growth of the US economy in recent years have intensified budgetary pressures in many states. Faced with constitutional, statutory, or customary requirements for annually balanced budgets, a large number of states have been forced to reduce or reallocate spending. The potential to defer or obfuscate in making these adjustments is very real. That is why the need for comprehensive and accurate accounting and transparent reporting of the financial positions of individual states is even more compelling. and disclosing budget and related financial information. In addition to assigning grades, the Volcker Alliance proposes a set of best budgeting practices for policymakers to follow. Critical to this work has been the cooperation of eight universities, each with a demonstrably strong interest in public service education and particularly in the management of state and local governments. The Alliance hopes to assist schools of public policy and administration by helping to widen the scope of research in the areas of public budgeting and finance while training students looking toward careers in state and local governments. The universities’ research efforts were augmented by Volcker Alliance staff, data consultants at Municipal Market Analytics, and special project consultants Katherine Barrett and Richard Greene. The Volcker Alliance plans on releasing an update to this project by the end of 2019, which will include updated fiscal year 2018 results as well as preliminary fiscal year 2019 results. © 2018 VOLCKER ALLIANCE INC. The Volcker Alliance Inc. hereby grants a worldwide, royalty-free, non-sublicensable, non-exclusive license to download and distribute the Volcker Alliance paper titled Truth and Integrity in State Budgeting: Preventing the Next Fiscal Crisis and its associated data sets for non-commercial purposes only, provided that the Paper’s copyright notice and this legend are included on all copies. The Volcker Alliance is a 501(c)3 nonprofit organization.